In a city as sprawling as Calgary, with winter temperatures that can make even the most hearty of winter-sport enthusiasts balk— it can be easy for most of us to stick with what we know, using cars and public transport to get from point A to point B. If you’re afraid you don’t have what it takes to become a habitual commuter, fear not. Easing into biking to work, school and beyond doesn’t have to be an uphill journey, especially if you follow a couple of simple tips for commuting success. Learning to commute is just like riding a bike. Actually, it is just riding a bike. 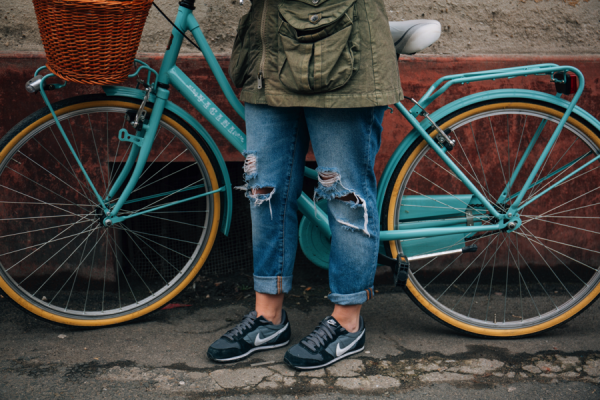 We spoke to commuting enthusiast, Ruth Kohut, Manager of the Genetics Department at the Alberta Children’s Hospital, to learn about the ins and outs of how to become a bike commuter. When asked about her first experiences, Ruth was happy to share, citing that her own decision to begin was largely based on an attempt to avoid car use. Despite Ruth’s love of commuting, she went on a bike-hiatus while having children, and her re-introduction to it saw some obstacles. Like Ruth, most people find themselves hesitant to bike-commute because of a number of common obstacles ultimately dissuade them. Ruth is quick to offer suggestions for how to overcome these obstacles. “The distance from my home to work is long – There are workarounds for this given the free park and ride locations. Some may consider job selections based on location and commute. The availability of a shower at work – Fortunately most hospitals have this, but not the community offices. Day care hours and after school kid schedules – This takes loads of planning, admittedly, so be prepared. I don’t have a good bike and they are too expensive – There are good used bikes available through online bargain or community sites. I don’t know how or want to look after a bike – There are lower cost bike repair options available, whether at some of the local repair shops or by those who do it as a hobby. The helmet messes my hair – This is true. Maybe a tiny hairbrush in your bag would help. First and foremost, don’t think about the effort–think about the wonderful smells, colours and views you experience on the ride. If you have a head wind going to work, maybe you will be treated to a tail wind going home! Commuting is mental and physical. Perfectly good, used bikes can be found online. This is a great alternative to begin commuting if you’re unsure you want to invest in something expensive. The bike should have lights on both the front and back, as well as a bell (and don’t hesitate to use it!). If you’ll be riding in the rain, I highly recommend fenders. A helmet is an absolute essential for all commuters. Keep in mind that helmets have a lifespan so make sure to check the helmet for cracks regularly. Go to a city pool and ask for one as they hold them behind their desk, or download one online here. Merino wool is a great pick because it wicks away sweat while on the ride, making for a drier, happier commute. In the winter, it’s important to remember to layer well. Beyond this, one must-have is a backpack that allows air circulation between your back and the pack, as well as a breathable rain-jacket for wetter days. At a minimum this should include a tube and CO2 cylinder. Ruth carries a tube, glue-less repair kit and a pump. You could cheat and call AMA as those with a card get assistance if they need help with a flat tire. Need we say more? Cycling can be thirsty work! When we asked Ruth about her experiences commuting to the Alberta Children’s Hospital, she’s delighted to report that the quality of routes and paths within the Northwest are excellent, and generously shared her preferred cycling destination within Calgary. While the introduction to commuting has its own twists and turns, the experience is hard to beat. Ecologically sustainable, gas-money saving, and muscle-tone building — commuting presents benefits across the board. Ruth’s final words of wisdom on the topic are the final push we need to step off the ground and onto two wheels. Ruth recommends using a diary to give yourself a pat on the back when you advance to the next stage. Her current commute is 30-35 minutes one way in the summertime. This is too short for her, so she often takes the long way to get to work (60 minutes). Be easy on your knees. Always keep your peddling in a gear that you are not excessively pushing down. You may wish to use a roller to easily rotate your neck or an IT band after a ride. Try it and don’t be shy to get off your bike. Maybe next week you’ll make it all the way! Hoping to test out commuting close to home? University District is excited to offer 12 kilometers of nature-sided pathways throughout the community, including a two-way system that balances cycle and pedestrian friendly transport. Excited to get started? We’d like to welcome you to join us at the Discovery Centre where we’ve partnered with Bow Cycle to host a bike tune up event on July 22 starting at 1PM. Stay tuned for more details!